Lately, I have been drawn to the bigger gauge yarns. I am talking big big here, super bulky, super chunky and needle size US#15 and up. It stills my impatience and it fuels my hunger for quick projects. Instant gratification is highly appreciated by me these days! For the past few days I have been designing with Misti Alpaca Super Chunky and Rowan Big Wool. 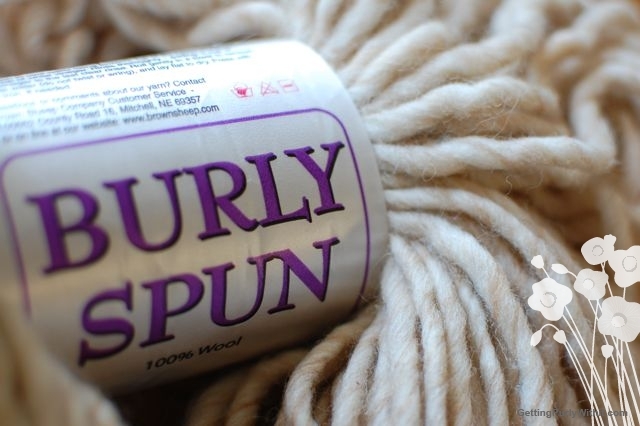 And I am about to try out some Burly Spun by the brand Brown Sheep. Oh goodies! 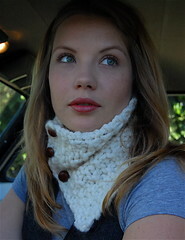 My very first project with Super Chunky Solid my Misti Alpaca was the Kassandra Cowl which I designed in 2008. 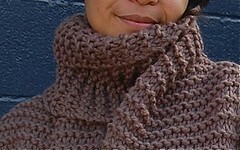 My friend Kassandra LOVED that cowl and thus I named it after her. This luscious yarn is a 50-50 blend of Alpaca and Merino and therefore has superb softness, incredible warmth and a somewhat heavy hand. My favourite gauge with this yarn is needle size US15, I simply love it. For years I neglected this Big Wool by Rowan but when I made this super quick garter scarf last year, I was hooked! 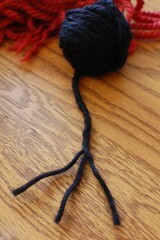 What I especially like about this yarn is that despite its bulkiness, it is not heavy at all. 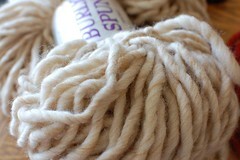 This 3-ply yarn holds airiness and lightness, much to my surprise. It is therefore excellent for bigger projects like coats, in my opinion. Also a plus with this Big Wool, is that it comes in many nice colors. 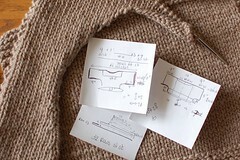 Of course, being a Rowan yarn, it has a pricey tag: it retails for about $16.-- for 87 yards/100gr. 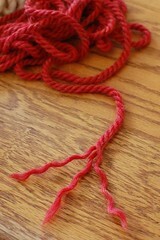 I love working with this yarn in several needle sizes, being US15 to US19. I have worked with Brownsheep's Lambspride worsted and Lambspride bulky before, but I haven't tried their super bulky Burly Spun before. At first I was hesitant to try it out since it is a single ply and I was afraid it wouldn't hold up as well. Only one way to find one, yes? It is a 100% wool and it kind of feels like Rowan Big Wool; same lightness and fluffy feel. I am going to play with it for the next few days and will let you know how it worked for me! What are you designing with all of this super bulky weight, Nancy? You guys, it's killing me but I cannot blog about it. I hate to keep secrets from you, but I cannot blog openly about this project because I may submit it to be published elsewhere than here on Getting Purly With It. Other than that, if I decide not to submit it for publication, I might produce several of my designs to be sold in boutiques in Manhattan. You know I love you all, but sometimes, just sometimes, I need to keep certain design instructions to myself. I am sure you understand. Okay. Fine then, Nancy. 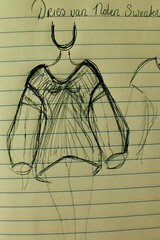 How about your Dries van Noten Sweater? I have figured out all the crucial points in this design and I have written out the entire instructions. Yay! See, when I worked at Closeknit on Alberta Street I had all the material at my fingertips and money was no issue at all. Nowadays, things are differently. 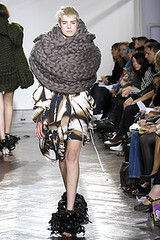 So, until I have accumulated some funds, I will purchase a big old bag of yarn and bust out my Dries van Noten sweater! Submitted by JelliDonut on Wed, 08/18/2010 - 00:48. Can't wait to see what you have up your sleeves. I'm been thinking of playing around with some of the big yarns too, but the big price tags are making me hesitate. Submitted by Nancy Ricci on Wed, 08/18/2010 - 07:27. 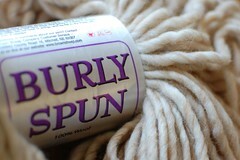 Susan, go for Burly Spun if you can find some in your LYS. It is by far the least expensive (approx 18.-- for 130 yards). Oh how exciting, we both are working on something secret!